If you you stop by the Safeway bakery in a chic Georgetown neighborhood, you’ll probably be helped by a bubbly, blue-eyed woman named Tiffany Giuliani. Like most customers at the store—considered a local hangout—you’ll probably be impressed with her professionalism, product knowledge and friendly approach. If you got to chatting, she might tell you about her awesome apartment a Metro ride away, and how much she loves living and working in the bustling D.C. area. You’d probably never guess she’s battled a learning disability all her life. 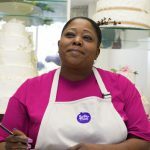 If it weren’t for her start at Sugar Plum Bakery, Tiffany’s life could have turned out much differently. “Sugar Plum was my first job,” she says. “I was around 14 and asked if they were hiring. They said that I couldn’t handle the machines yet, so I started volunteering.” Before long, Executive Director Patricia Rakes Clark took notice. “Trish said, ‘you are an amazing worker, and we want you on our team.’ Without me even asking, she handed me an application. It made me feel so good!” Even with Tiffany’s dedication and work ethic, though, the early days came with challenges. “Because of my disability, it takes me longer to learn than other people,” she says. Tiffany would grow to be one of the bakery’s most valued workers. She became skilled at customer service, learning how to resolve problems on her own—and when to bring in a manager for help. She has carried these skills into her work at the Georgetown Safeway, where she continues to impress. Craig Gross, her supervisor, extols Tiffany’s work ethic and friendliness with customers. Since her time at Sugar Plum, Tiffany has nearly completed a child development associate (CDA) degree and has worked with her mom and stepdad, who live nearby, to renovate her co-op apartment. But of everything she gained from Sugar Plum, her best memories are the people. “Whenever I’m in town, I stop in and see them,” she says. “Trish is amazing.” The feeling is clearly mutual. “I am so excited to see how Tiffany is working and living on her own and enjoying a full life,” responds Trish. “Her success reflects our mission, because we advocate supported employment opportunities for people with disabilities so they can become financially self-supporting. She is a perfect example of how businesses are integrating people with disabilities.